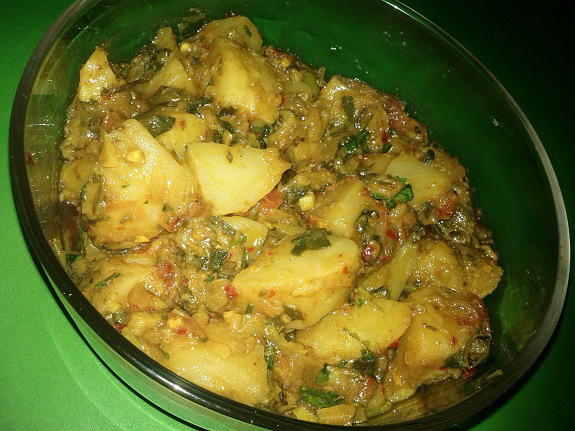 For potato lovers, spicy potato curry is a very simple and spicy recipe of boiled potatoes with fresh green herbs. Taste best in breakfast with parathas and chapattis. Boil potatoes in plenty of water, peel them, cut them and keep them aside. Heat onion in a pan and fry onion in it till its light golden, then add garlic and fry till garlic is golden brown and fragrant. Add salt, turmeric powder and red peppers and fry for a minute. Next add tomatoes, spring onion and green chilies and cook over medium flame till tomatoes get tender and their water dries out. When tomatoes water dries out and oil comes up, lower the flame and add boiled potatoes, cumin seeds and coriander and cook over very low flame for 10 to 15 minutes. Pour in a serving dish, garnish with fresh parsley and serve hot.